The Spelling Dictionary Word window is displayed by the Add and Change buttons on the spelling dictionary window. The Spelling Dictionary Word window is used to define a correct spelling entry or an auto correct spelling entry in a custom spell check dictionary. A correct spelling entry is created by entering the word to treated as correctly spelled in the Word to add field. Then choose the Treat the word as correctly spelled selection and click Ok.
An auto correct spelling entry is created by entering the word to be automatically replaced in the Word to add field. Then choose the Automatically replace selection and enter the replacement word or phrase in the Replacement word or phrase field. Note the word in the Word to add field must be a single word consisting of only letters and digits. The Replacement word or phrase field may be multiple words and include characters that are neither letters nor digits. Checking the Change casing to match the word being corrected check box allows the letter casing of the replacement word or phrase to be changed to match the casing of the word it replaces in the document. For example, suppose an auto correct spelling of "elephante" is to be replaced by "elephant". 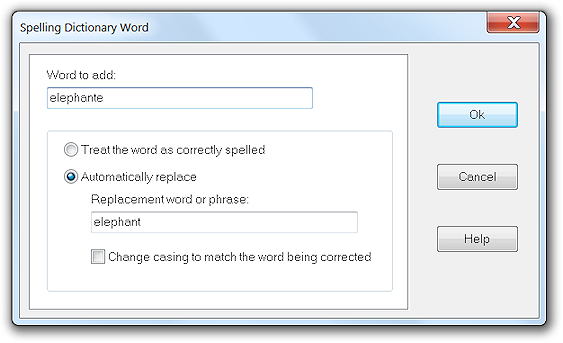 If Change casing to match the word being corrected is checked then typing "Elephante" in a document will result in the word being replaced by "Elephant". If Change casing to match the word being corrected is not checked then the replacement word or phrase is always placed in the document exactly as it was entered into the custom dictionary. For our example, typing "Elephante" in a document would result in the word being replaced by "elephant".